Here's the trailer (below) for the upcoming film Creation, which is based on the book Annie's Box by Charles Darwin's great-great-grandson Randal Keynes and shot in part at Down House, the Darwin family home in Kent. 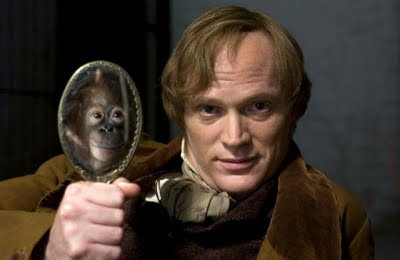 The film, which opened the recent Toronto International Film Festival, stars real-life couple Paul Bettany (in photo above) and Jennifer Connolly. Visit the film's excellent website here; The Hollywood Reporter has a glowing review here; the Los Angeles Times previews the film here. Roger Ebert has some interesting things to say about the film in his online journal, as does Eugenie Scott at Panda's Thumb. Can it possibly be true that Creation is having trouble finding a US distributor because Darwin's theory is, according to Jeremy Thomas, the film's producer, "too controversial for American audiences"? His assertion that "outside of New York and LA, religion rules" is patently absurd. Thomas's comments smack of a disingenuous marketing ploy. . .they're just too ridiculous to be sincere. How unfortunate, since all signs are that the movie is superb and can stand on its own without the whipping up of a fake controversy.